In addition to news about Israel, Srugim and waffles, The Muqata Blog has also been following the US Tax code and its implications to expatriate US citizens living in Israel. We discussed the FBAR and the IRS child tax credit option. The IRS requests a boatload of documentation that must be provided within 30 days. I read through this request...and thought, "Well, that's not SO bad. I could get all that data together in 30 days". And then I did the wrong thing, by googling "IRS Audit"
Q: What are my chances of getting through an audit without owing additional taxes? A: Fewer than 25% of audit victims make a clean getaway. The IRS audits half as many taxpayers today as five years ago, but the take per audit has increased. The IRS, thanks to its sophisticated computer selection process, audits only those returns in which adjustments are almost a certainty. Realize the odds are against you and focus on limiting the damage from an audit. Limiting the damage? I filed using a professional CPA and tax preparer. He doesn't try to bend or break the rules. In 2009, the Stimulus Act of the Obama Administration meant that instead of having a reported income of more than $8000 a year, American citizens in Israel only needed $3000 a year in reported income in order to qualify for a tax credit of $1000 per child. This means that the American government is helping its citizens by distributing money, and a check can come to your mailbox with $1000 per child, if you act now. This is not a gimmick. Mishpacha Magazine (page 1, page 2) has a whole write-up on the onslaught of IRS requests for audits, quoting CPAs that "We've entered a new era...we've been receiving requests from people who are being audited... something that's never happened before [in Israel]"
- Those who naturalize their children during a given tax year, cannot claim the tax credits retroactively for previous years. These are common practice among the less reputable tax preparers – some of whom don't even sign the tax return! 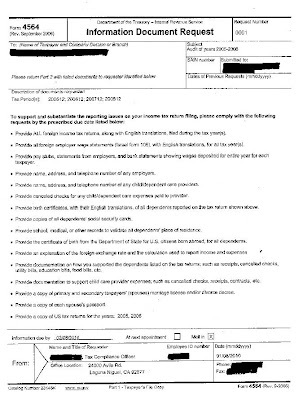 When faced with an audit, the onus is on those who signed the form. Make sure you KNOW what you're signing when filing your 1040. With a less than 25% chance of a clean getaway on an audit -- the IRS is not who you want to mess with; even in Israel. If you want the name of a reputable CPA tax preparer, and not some fly-by-night scammer, drop me an email. I've always heard that people fund the trips to the US with the retroactive credits. Amazing that it's illegal. So, do you still have to be worried if you didn't do all of these shady things? Like, if you just reported your actual income and they sent you a check? I always thought that it was too good to be true that all my American friends were getting these fat cheques and voting in their elections and with no responsibilities. So is that $3000 eligibility for the tax credit true? MII: Its obviously illegal -- whats amazing is that "consultants" tell clients to do it. Abbi: Unfortunately, even if you did everything above board (reported actual income), you may be "eligible" for an audit (because of all those who don't). The person who received the request for info from the IRS (that I posted), is also above board. Josh: The check is valid IF (and its a big IF) they do things exactly by the book, without trying to "maximize" the tax credit rebate. Gary: Yes, it is true, but I highly recommend you use a licensed CPA and tax preparer -- not a place that advertises the refund as "part of Obama's stimulus program"
It's not illegal. I believe what MII is referring to is that US citizens living in Israel file tax returns as they are required to do, and as a result, they are entitled to a healthy credit. (If you use tax-prep software such as Turbo-Tax, you'll see as you prepare your return that the money is coming to you.) They then use this money to finance a large part of the cost of flying their family to the US for a few weeks. I'm not sure why anyone would think this is illegal. The fact that someone is audited does not mean that he broke a law. It seems that the IRS got wind of the fact that people were taking advantage of the general lack of oversight for overseas filers, and decided that imposing some order was worth the cost of stationing some auditors in Tel Aviv. Yoni R. I'm not talking about that at all. People fly their large families to the US, take a vacation, get citizenship for the kids, take retroactive tax credits for the last several years, and have some money left over plus the promise of future credits. (We are American, have always filed returns and receive the tax credits).We have not been audited (bli ayin hara). Why do you say that it's illegal to do that? Jameel said it, not me. I didn't know. Anonymous: Can you find me a judge or IRS auditor who will consider learning in Kollel as a "scholarship" or "fellowship income". To date, that has not been the case.